Peter B. Doghramji’s new book “Christian Ethics in the Muslim Context” is a timely dissertation tackling the hard questions regarding Christianity in Muslim countries. 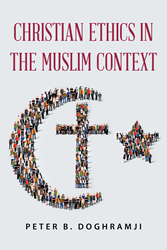 Recent release “Christian Ethics in the Muslim Context” from Page Publishing author Peter B. Doghramji is an informative look at the ancient works an Eastern Christian theologian to help answer the contemporary question: how should a Christian live in a Muslim context? Peter B. Doghramji, a doctor of theology, teacher, missionary, and native of Syria, has completed his new book “Christian Ethics in the Muslim Context”: a well-researched dissertation addressing the modern-day Eastern Christian in the world of Islam using the works of Eastern theologian, Abu Ishaq Ibn Al‘Assal, who analyzed and upheld the foundational truths of the Christian life. Published by New York City-based Page Publishing, Peter B. Doghramji’s thought-provoking account utilizes the wisdom of the old to answer the questions of this age surrounding Christians who find themselves as a minority in a hostile environment. Instead of turning to find solutions in a Western context, Doghramji encourages the conversation to start with its Eastern roots established before the rise of Islam. Readers who wish to experience this enlightening work can purchase“Christian Ethics in the Muslim Context” at bookstores everywhere, or online at the Apple iTunes store, Amazon, Google Play, Kobo or Barnes and Noble.